Corticosteroids (commonly referred to as steroids orcortisone) are a class of steroid hormones that are produced in the adrenal glands. Corticosteroids are involved in a wide range activity in the body, including the stress response, immune system response, control of inflammation, nutrient metabolism, and maintenance of blood electrolyte levels. Glucocorticoids such as cortisol control carbohydrate, fat and protein metabolism and reduce inflammation through several different mechanisms. Because of their anti-inflammatory properties, corticosteroids are a valuable class of medications. They are commonly used to treat mild inflammatory conditions, or to suppress the inflammation associated with an allergic response. When administered in high doses, they act as immunosuppressant drugs. Most forms of corticosteroids that are prescribed are synthetic, and include prednisone, prednisolone, dexamethasone, triamcinolone, and methylprednisolone. These synthetic forms of corticosteroids are many times more potent than the naturally occurring forms and typically last much longer. Because of their increased potency and duration of activity, if synthetic corticosteroids are used, the patient must be carefully monitored to minimize the risks of serious side effects. 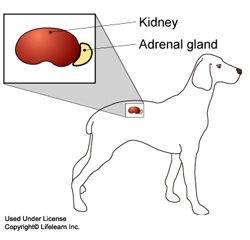 Corticosteroids may have both short term and long term side effects that cause different problems in your pet. It is easier to discuss these side effects as either short-term or long-term side effects. What are some of the short-term side effects? What are some of the more common long-term side effects? "A patient receiving steroids will not experience the usual symptoms of urinary tract infection..."
Urinary Tract Infections (UTI) in up to 30% of patients. 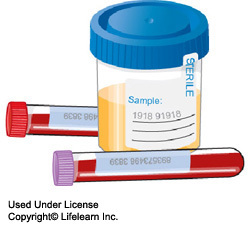 Monitoring for the development of UTI is achieved by performing periodic urine cultures. A patient receiving steroids will not experience the usual symptoms of urinary tract infection because the steroid will suppress the inflammation and discomfort commonly associated with a UTI. In many cases, a urine culture may be the only way to detect the infection. development of adult onset demodectic mange. An excessive level of corticosteroids may cause Cushing's disease. When a pet is on long-term, high doses of glucocorticoids, there is an increased risk that it will develop a condition called iatrogenic (medication induced) Cushing's disease. The clinical signs of Cushing's disease include increased thirst and urination, an increase in UTI's and skin and ear infections, a "pot-bellied" appearance, thinning skin and hair loss. In the treatment of some diseases, the risk of iatrogenic Cushing's disease is unavoidable. To minimize this risk, corticosteroid doses are tapered down over time, or several different drugs may be used in combination. "Most corticosteroid protocols require daily use only during the initial treatment phase." Avoid using glucocorticoids on a daily basis except when specifically instructed by your veterinarian. Only life-threatening immune-mediated diseases require long-term daily steroid use. Most corticosteroid protocols require daily use only during the initial treatment phase. If your dog is receiving corticosteroids to reduce itching or for musculoskeletal pain, you should strive to administer them every other day. If you feel your pet requires daily corticosteroid use, inform your veterinarian, who may recommend an additional or alternative treatment combination. 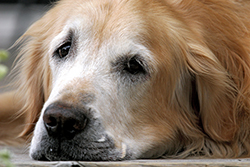 If your dog requires more than three to four months of corticosteroid usage, the condition should be re-evaluated or other treatment options should be pursued. .
Corticosteroids can be life-saving medications and improve the quality of life for many dogs. By working closely with your veterinarian, you can safely administer these drugs and provide your dog with the high quality of care he needs and deserves. If you have any questions or concerns about your dog's medications, please call us.